A public entertainment hall and skating rink. The hall had one of the first electric lighting systems in Townsville. A “Compton Dynamo” generating set was installed there in 1889. This provided power for the rink and the hall. Most other establishments did not seem to have had electricity until the installation of a municipal electricity supply in 1922. The hall stood on a site on the corner of Sturt and Stokes Streets which later became the Olympia Picture Theatre. It has been a car park for several years across from the old Magistrate Court House. In 2005 this site became a Woolworths Supermarket. NQ Herald, 8 Sept, 1888: A company is being formed to construct a skating rink. Dec 1888: John MacPherson and George Newman leased from John Deane, Allot. 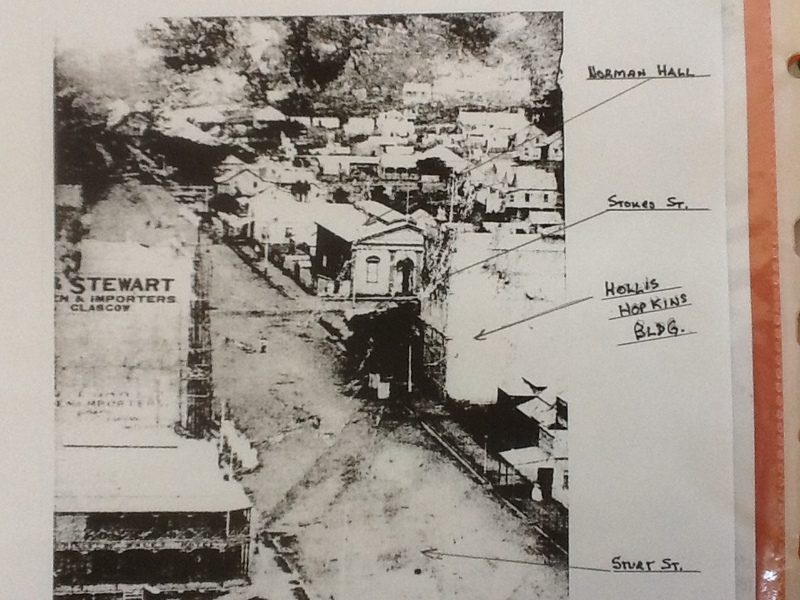 11 of Section 8 cnr Sturt and Stokes Streets to build the Norman Hall to be operated by the Townsville Rink and Recreation Coy Ltd.
Ex. Star, 8 Jan 1889: Construction begins on new skating rink cnr Stokes & Sturt Streets. NQ T. 9 Feb, 1889: Behrenos to light Norman Hall skating rink. Ex. Star, 27 Feb 1889: Roof installed. NQ T. 6 April 1889: nearing completion. NQ Herald, 18 May 1889: Townsville Rink & Recreation Coy, Hall 123′ x 50′, Floor 90′ x 50′, Stage 27′ x 50′. At the upper end is the Vestibule, Ticket Office, Ladies and Gents, Cloak Rooms, Utilities. Height 23′ floor to ceiling. Designed for Maryboro Pine secret nailed. Ventilated on the Tobin Principle: windows. Workshop for repairing skates off stage: contractor – J. Bannett. To be lit by electricity but not yet working. D. H. Behrenos installing. The proposed steam engine has arrived yet still being run from a temporary engine at Thomsens wood works.. Four Arc and 22 incandescent lamps which cost a little over 1500 pounds. Land ownedby John Deane with ground rent paid by the Townsville Rink & Recreation Coy, Stephen J. Byrne (Manager). Opened to the public for the first time last Saturday, the Town Band attended. NQ Herald, 6 July 1889: John Deane applied for a licence adjoining the Norman Hall. M.B. page 45, 6 Mar 1890: Rink Company requested a gas lamp at Norman Hall. M.B. page 64. 20 Mar 1890: Lamp moved from Court House to Norman Hall. NQ T. 22? Mar 1890: Fire at the Norman Hall during a performance of the T.P.V.A. Minstrels. NQ Herald, 29 Mar 1890: Cyclone: Norman Hall partially flooded, several windows blown out and corrugated iron fence shaken. NQ Herald, 31 Jan 1896: Norman Hall damaged by Cyclone Sigma. NQ Herald, 22 July 1896: Norman Hall bought by Whalley & Son.